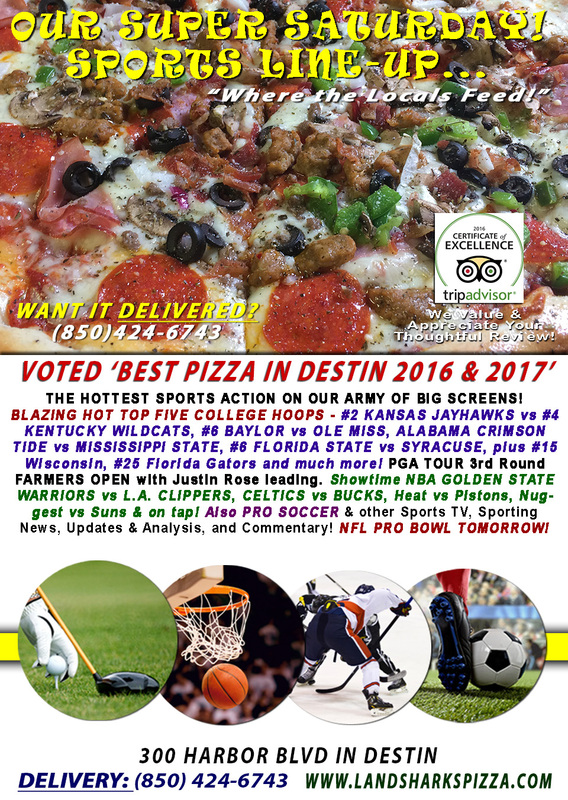 / Best Pizza In Destin Florida / BLAZING HOT HOOPS SATURDAY in Destin – College Hoops, NBA, PGA Farmers 3rd RND & Tons More! BLAZING HOT HOOPS SATURDAY in Destin – College Hoops, NBA, PGA Farmers 3rd RND & Tons More! TODAY’S SPORTS ON OUR ARMY OF BIG SCREENS – BLAZING HOT COLLEGE HOOPS #2 KANSAS vs #4 KENTUCKY, #6 BAYLOR vs OLE MISS, ALABAMA CRIMSON TIDE vs MISSISSIPPI STATE, #6 FLORIDA STATE vs SYRACUSE, plus #15 Wisconsin, #25 Florida Gators and much more! PGA TOUR 3rd Round FARMERS INSURANCE OPEN with Justin Rose leading. NBA ACTION with the GOLDEN STATE WARRIORS vs L.A. CLIPPERS, CELTICS vs BUCKS, Heat vs Pistons, Nuggest vs Suns & on tap! NFL PRO BOWL ON SUNDAY! Also, PRO SOCCER plus plenty of other Sports Broadcasts, Sporting News, Analysis, and Commentary! WE’RE GOING BOTTOMLESS FOR SUPERBOWL 51 & YOU’RE INVITED! BOTTOMLESS Award-Winning WINGS, DOMESTIC BEER, CRAFT BEER & WINE – Party ’til your heart’s content here at Landshark’s as the PATRIOTS take on the FALCONS Sunday February 5th! Reservations are filling up fast to GRAB YOUR SPOT with an easy phone call to (850)424-6743 or just stop by the restaurant! LANDSHARK’S SPECIAL DELIVERY FOR SUPERBOWL 51 – SUNDAY FEBRUARY 5TH! Let US do the work for you! 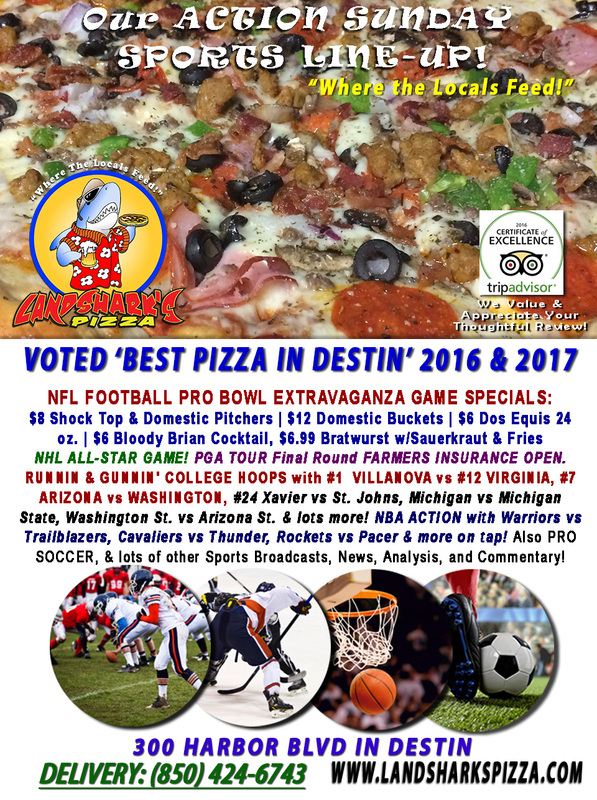 We’ve got a huge menu of AWARD-WINNING FOOD including 2017 BEST IN DESTIN PIZZA, Award-Winning HOT WINGS, Oven-Baked Subs, Brick Oven Calzones, and mouthwatering APPETIZERS that will turn your Superbowl gathering into something really special & EVERYBODY will thank you! 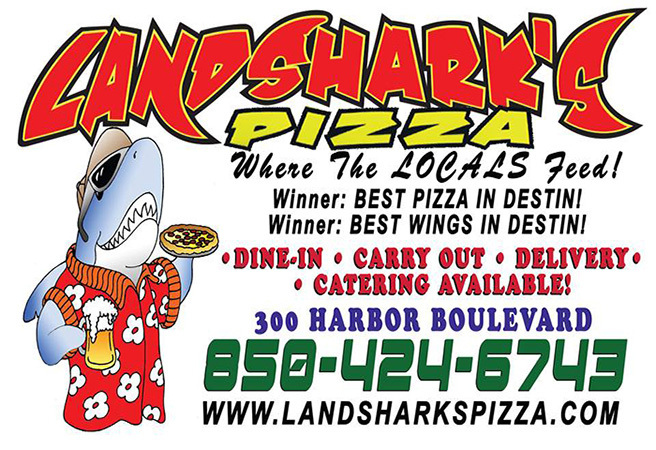 BEAT THE RUSH, CALL LANDSHARK’S PIZZA CO. TODAY: (850)424-6743 & Place your order! 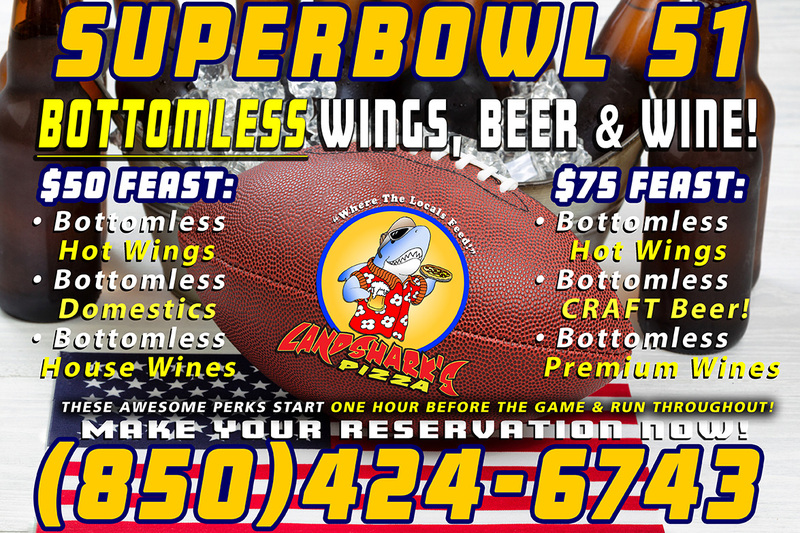 Previous Post: « BOTTOMLESS SUPERBOWL@Landshark’s! BOTTOMLESS WINGS, DOMESTIC BEER, CRAFT BEER & WINE! (850)424-6743 TO RESERVE!